Armed with a pitcher of margaritas, my cd player and an assortment of cleaning products, I whiled away the entire evening diligently cleaning the floor and washing dishes. My pristine floor lasted maybe 24 hours. My husband has since tracked corn oil all over it. I’m not too sure how this happened and I do not think I want to know. That said, the purpose of this post is not to bash my ‘nabes. Rather, it is to highlight a problem they seem to have courtesy of their landlord’s crappy construction. As I stated in a previous post about “Beepy”, the landlord next next door raised the roof on the backend of his building. As a result, the roof rises about six inches above the bottom sill of our windows. 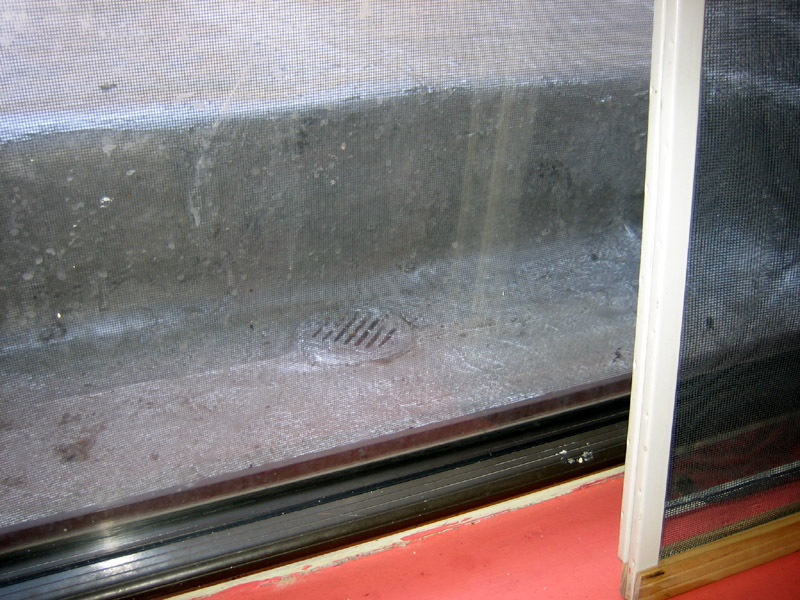 In order to comply with fire code and account for water runoff, he created trough-like openings around both my and my neighbor’s windows. I realize this is a little difficult to understand, so here is a picture of one of them. Located in each of these trenches is a smallish drain, which you can see here, which brings me to what I witnessed last weekend. As I was washing dishes I heard the sound of splashing water hit the roof. 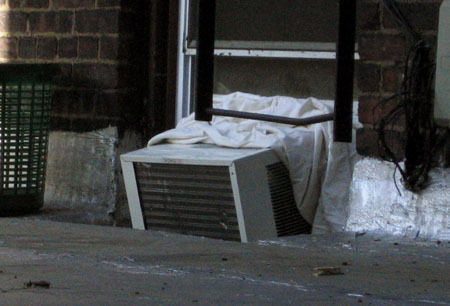 I peered out the window and noticed my neighbors stuffing a wet shirt between the top of their air conditioning unit and the window. Although puzzled by this, I went back to work. Several hours later I heard it again. Dripping water. I looked out the window and saw them stuff another wet rag into this gap, making the air conditioner dip at a 70 degree angle. 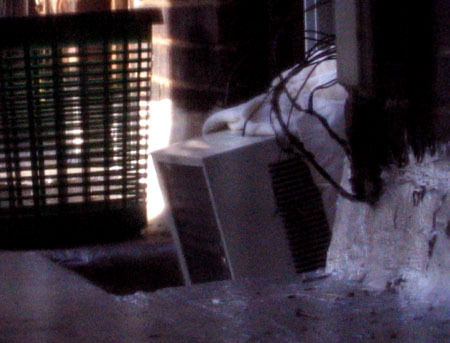 That’s when I realized what my neighbor’s problem was: instead of going down the drain, the runoff from their air conditioner was leaking into their apartment. This is the only reason I can come up with for them doing this. The air conditioner has been positioned so the condensation will flow directly into the dinky drain they have been provided. To their credit, they did an admirable (if ugly) job of solving a ridiculous problem. I may very well end up doing the same thing. I would love to meet the ‘architect’ who drew up this ‘plan’. I bet it was rendered on a piece of manila paper with crayon— the pretty metallic ones that you don’t get with the standard pack of Crayolas (the bastards!). Instead of being on file at the Department of Buildings, this M.C. Escher-esque masterpiece of poor design is probably taped to his mommy’s refrigerator.